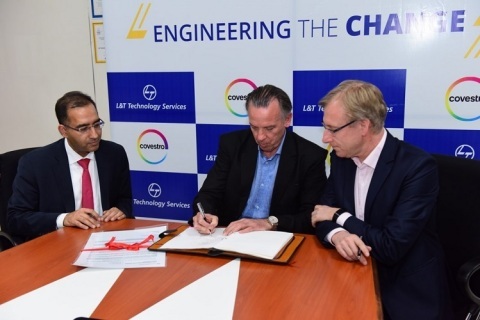 Germany’s Covestro, a world-leading manufacturer of high-tech polymer materials, has chosen L&T Technology Services Limited (NSE: LTTS), as one of its major engineering services partners to implement digitalization based Engineering Programs across Covestro’s global locations. L&T Technology Services, a global leading pureplay ER&D services company, has been awarded a multi-million dollar contract by Covestro to execute these engineering transformational programs. Covestro is running a digitalization program for engineering, operations and maintenance activities: “OSI2020” (Optimized System Integration). Within this program, L&T Technology Services has been selected as the engineering partner to drive digital transformation across Covestro’s 8 global locations, especially in the area of data migration. Covestro has also embarked upon another strategic initiative to harmonize their Global Engineering Standards & Practices to increase efficiency of Capital Investment Projects. LTTS is the preferred partner to assist Covestro in defining, developing and maintaining these standards in line with global practices. This will include updating & improving engineering standards & specifications backed up with knowledge management & cognitive learning tools. “L&T Technology Services has a proven track record of delivering innovative solutions, processes, and technologies for enterprises across the globe. We are confident that the potential and experience of LTTS will enable us to incorporate solutions to deliver the implementation of Digital Transformation and Standards Harmonization. Their engineering experience in executing global projects will help Covestro to achieve the best-in-class Standards to execute projects. Our objective is to be prepared by having a comprehensive contract defining the full scope of work, meeting the requirement for different project phases and execution strategies such as FEL3, EPCM, EPC, etc. With these initiatives, we will optimize our project costs, timelines to ensure reliable and safe operations,” commented Ferry Feldbrugge, Head of Global Projects & Engineering and Global Technical Contracting, at Covestro. “It is our privilege to enter into this engineering partnership with Covestro, the world's leading supplier of high-tech polymer materials, and work with them on solutions that will benefit Covestro’s strategic vision. These programs will drive Covestro’s digital transformation and standardization journey across the globe. We look forward to leveraging our unique technology capabilities and our domain expertise in plant engineering and asset management to assist Covestro in achieving its objectives of Efficient Production and Engineering Excellence,” said Amit Chadha, President Sales & Business Development and Member of the Board, at L&T Technology Services Limited. L&T Technology Services Limited (LTTS) is a listed subsidiary of Larsen & Toubro Limited focused on Engineering and R&D (ER&D) services. We offer consultancy, design, development and testing services across the product and process development life cycle. Our customer base includes 52 Fortune 500 companies and 48 of the world’s top ER&D companies, across industrial products, medical devices, transportation, telecom & hi-tech, and the process industries. Headquartered in India, we have around 12,000 employees spread across 15 global delivery centers, 28 global sales offices and 39 innovation labs in India as of December 31, 2017. For additional information about L&T Technology Services log on to www.LntTechservices.com. With 2017 sales of EUR 14.1 billion, Covestro is among the world’s largest polymer companies. Business activities are focused on the manufacture of high-tech polymer materials and the development of innovative solutions for products used in many areas of daily life. The main segments served are the automotive, construction, wood processing and furniture, and electrical and electronics industries. Other sectors include sports and leisure, cosmetics, health and the chemical industry itself. Covestro has 30 production sites worldwide and employs approximately 16,200 people (calculated as full-time equivalents) at the end of 2017. Find more information at www.covestro.com and www.cfrtp.covestro.com.